Believe it or not, despite the huge disparity in scale, there are some items from the larger scale that can still be used in 1/6th. For about the same cost, you gain added detail and sometimes even better quality. 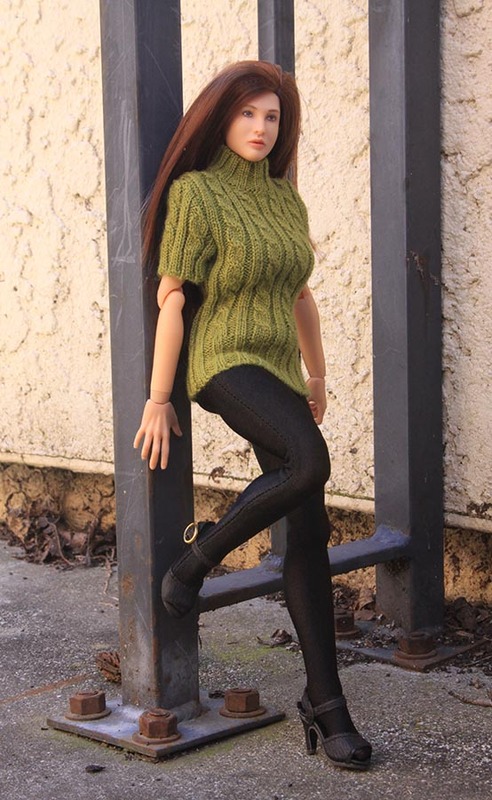 Here my custom Alpha, Michelle shows how a sweater from a Tonner 16" doll can work for 1/6th fashion. Her shoes are also made for 16" dolls, but fit the Alpha feet equally as well. They were purchased from the Facets By Marcia site. Her tights are made by Old Joe Infirmary (they still sell on eBay, and have a separate site as of this posting, 3/31/19).